One product for 95% of cleaning. A single Pure Crafted™ product will replace dozens of chemicals. Then complete your system with our specialty-use products. H2Orange2Combines Orange Oil and hydrogen peroxide to clean, deodorize, degrease, and sanitize any water-safe surface. Multi-PurposeNeutral pH hydrogen peroxide cleaner. Excellent deodorizer, glass cleaner, tile renovator, and more! 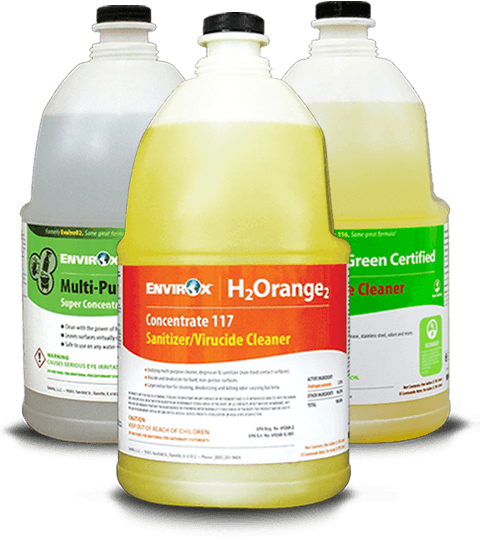 H202 OrangeNeutral pH hydrogen peroxide cleaner. Excellent deodorizer, glass cleaner, tile renovator, and more! Neutral Floor Cleaner: Low-cost, high-volume, streak-free cleaning with no sticky residue. H202 Orange Tile & Grout Renovator: Make your grout white again with the power of hydrogen peroxide and cold-pressed Orange Oil. Industrial Degreaser: Heavy duty degreasing without the safety and environmental hazards. Use on any water-safe surface. Carpet Cleaner: A complete solution. Use as a shampoo, pre-spray, spotter, traffic-lane cleaner, deodorizer, and more. Mineral Shock: Low-toxicity alternative to acid-based cleaners — and it works better, too! Pure Crafted™ products with one-of-a-kind cleaning power. With EnvirOx, you can take care of 95% of your cleaning challenges with just one product. For the other 5%, our specialty-use products have you covered. Best of all, our products are safer, healthier, and leave far less residue than typical cleaners. No more sticky surfaces that get dirty quickly and can harbor bacteria. Less worry about surface damage or worker safety. This is the core of our promise to you. Excellent cleaning results — with no harm to your people, your facility, or your budget. Achieve simplicity and savings from day one. SimplicityOne product cleans 95% of your facility — reducing training and cleaning time while replacing expensive specialty products. SavingsPure Crafted™ technology gives you more cleaning power while using fewer products, allowing you to consolidate. Easy TrainingOur easy-to-learn system makes training a snap. It's so simple to use, you can train your staff in less than 10 minutes. Replace your closet full of cleaners with a single streamlined cleaning solution. Tackle 95% of your cleaning challenges with just one highly effective, incredibly versatile product. Instantly simplify your cleaning program, reduce costs, and get great cleaning results. Safer, healthier products that are practically impossible to misuse. Fewer products and straightforward training materials means quicker, easier training.